We absolutely love the endless possibilities when it comes to the mix and match bridesmaid dress trend, it’s so fun to see what brides come up with! 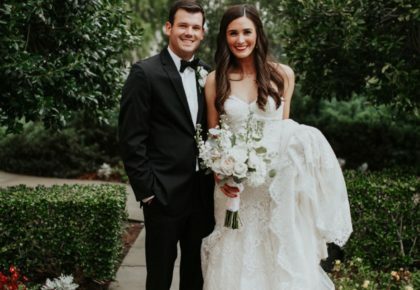 With so many styles, colors, fabrics and patterns, the process of choosing the perfect dresses may seem a little daunting. 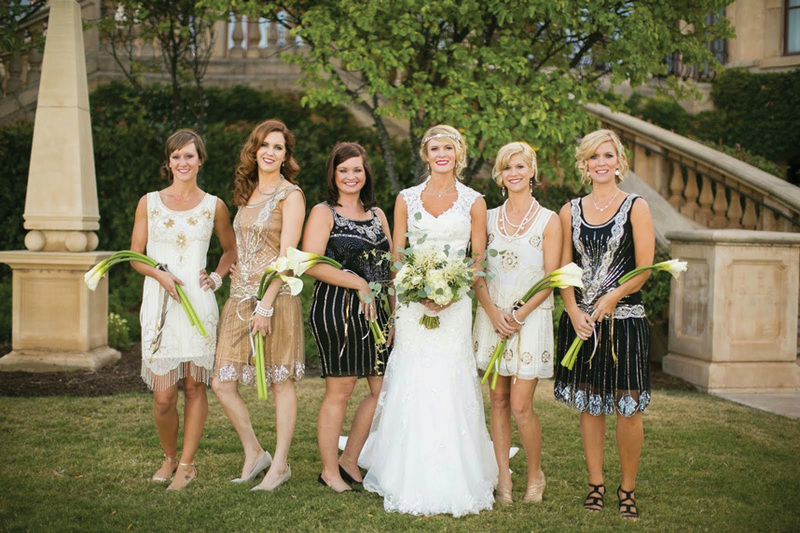 To take out some of the guesswork we sat down with Oklahoma’s expert Allison Richards, the owner of Prim, to get the full scoop on mixing and matching your maids, and we included some of our favorite takes on the trend to inspire you! Enjoy! 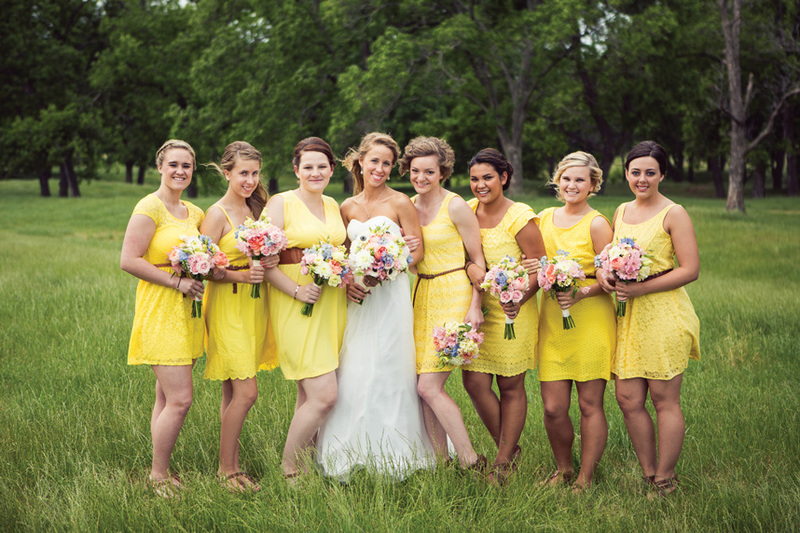 What factors should brides consider when going the mix and match bridesmaid direction? 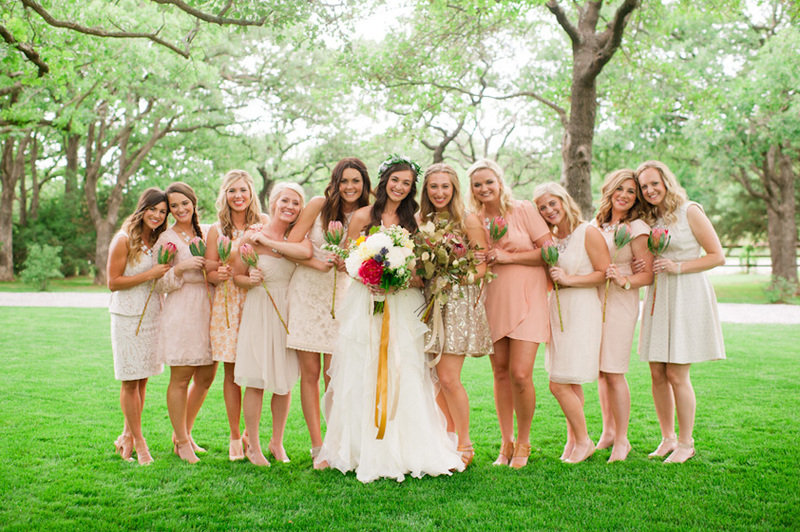 The options are endless when it comes to mixing and matching your bridesmaid’s dresses so you need to be specific about your vision early on in the process. You can mix styles, colors, fabrics or even all three! Once you have decided what you want, you are one step closer to achieving the perfect mix and match look. Do you have any recommendations on fabrics that work best for creating a cohesive mix and match stylish look? 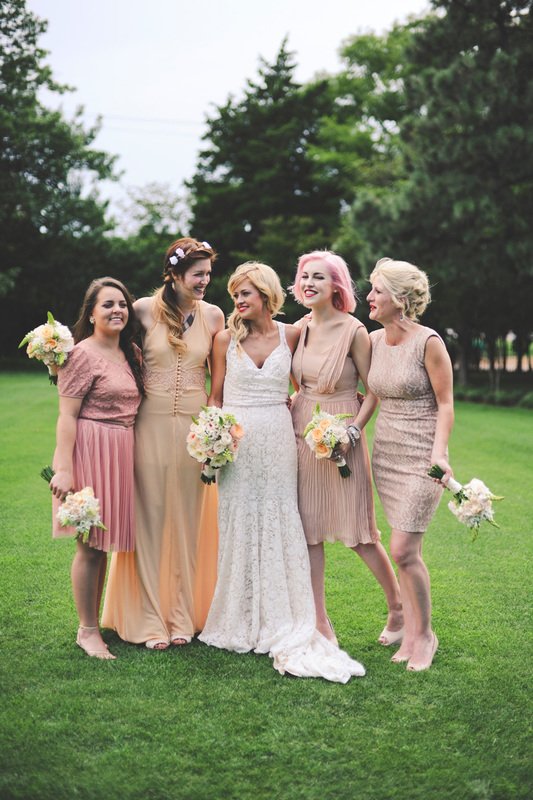 I actually love mixing all sorts of fabrics into a bridal party! It does give the whole look more depth but you do have to be careful or it may look more chaotic than pulled together. To make the look more cohesive, go with dresses that have the same general shape. 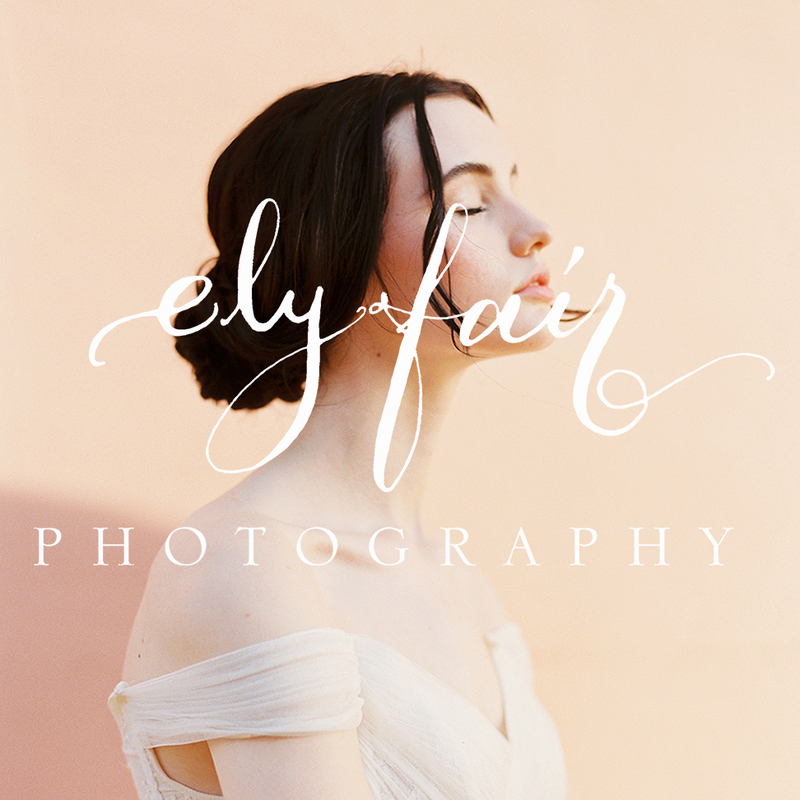 Flowy fabrics such as tulle, chiffon and beaded, work well together or mixing various structured/stiff fabrics are always an easy option as well. Is it safe to work in a pattern with the mix and match look? I love prints! Working with a pattern almost makes it easier to mix and match. 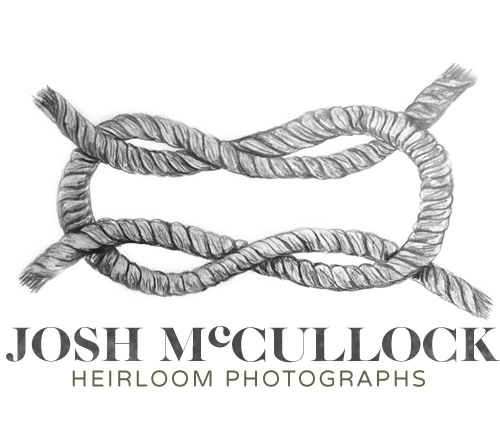 First you pick your print and then pull colors from the print to compliment your entire bridal party. 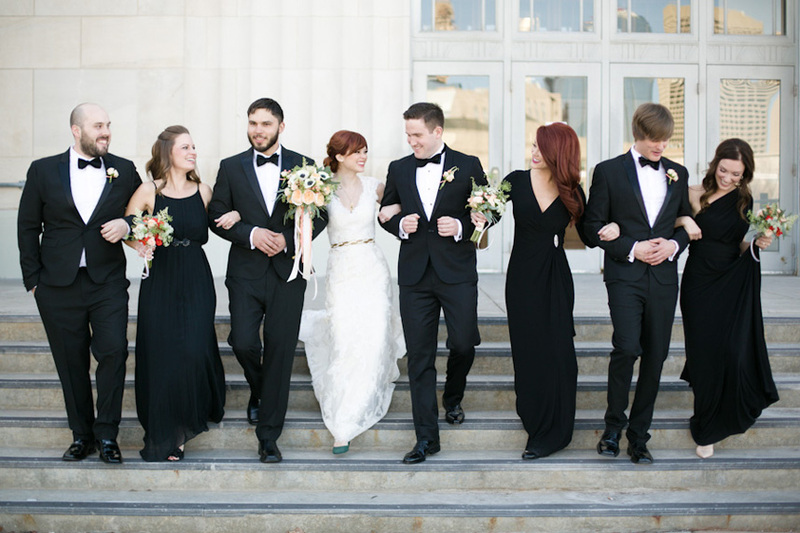 If you decide on incorporating a print, I would have no more than a quarter of the bridal party in that print, or even easier – just your MOH! 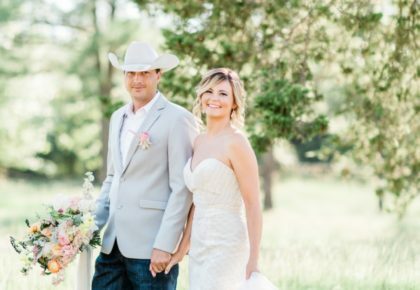 What designers do you carry that offer dress styles that might work best for a bride looking to mix and match? All of our designers have good ways to mix and match, below are some of the examples of our favorites. Amsale: Amsale has three different types of fabrics — chiffon, lace, and tulle. Chiffon is by far the most popular with over 30 different top styles and 34 different colors. 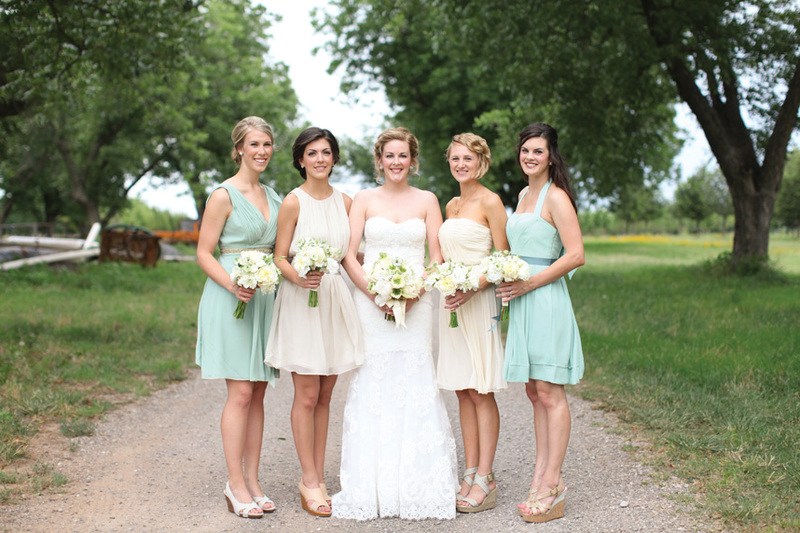 I also love when brides mix the fabrics by incorporating chiffon, lace and tulle all in the same color. Jenny Yoo: Their super popular convertible dresses are the way to go if you are looking for an easy way to mix up the styles. Everyone can get the same dress and just tie the top how they prefer. LulaKate: This is a great line because it is completely customizable. You can select the bodice style, waist band width, skirt style, skirt length, fabric and color. To keep the consistency you can pick the skirt style, color and fabric and your bridesmaids can select the top style they prefer. LulaKate is also a great line to mix colors, they have over 250 colors and 10 different fabrics. Donna Morgan: This line has some amazing colors that work well with mixing their popular styles. In addition to their chiffon, this year they have introduced lace and shantung. Joanna August: These dresses come in so many different styles that your girls are going to have a hard time picking just one! Adrianna Papell: One word – beaded. If that wasn’t enough to rope you in, take our word for it, these look AMAZING mixed into a bridal party. Dessy/Lela Rose: So many colors! Dessy uses the Pantone coloring so if you are looking for a specific pantone color – Dessy is the way to go. They have several shades of colors which make it easy to get a good variation of color within one designer. Really every designer can be mixed. I get really excited when a bride wants to mix the designers because not every designer has the same exact shade of a single color. For example if you want purples, each purple in the varying designers color palette will give the bridal party a nice monochromatic look without being too matchy-matchy. What are the benefits of going the mix and match route? People say all the time the bridesmaid dress selection was the hardest part of the wedding planning process. 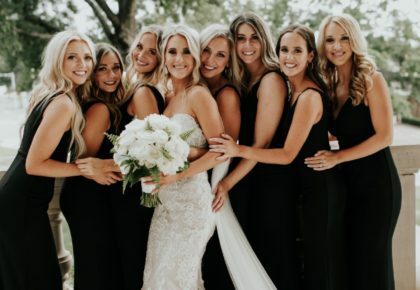 I think that is only the case when brides are trying to find one style in one color that works on every one of their girls. Everyone has different skin tones, different body shapes, etc. Take the stress off finding the perfect one for your girls by letting them select a shade and style that they find comfortable and feel beautiful in. Plus, when you mix and match, you are getting a completely customized look. No one is going to pull together the same exact colors and styles that you and your girls do. 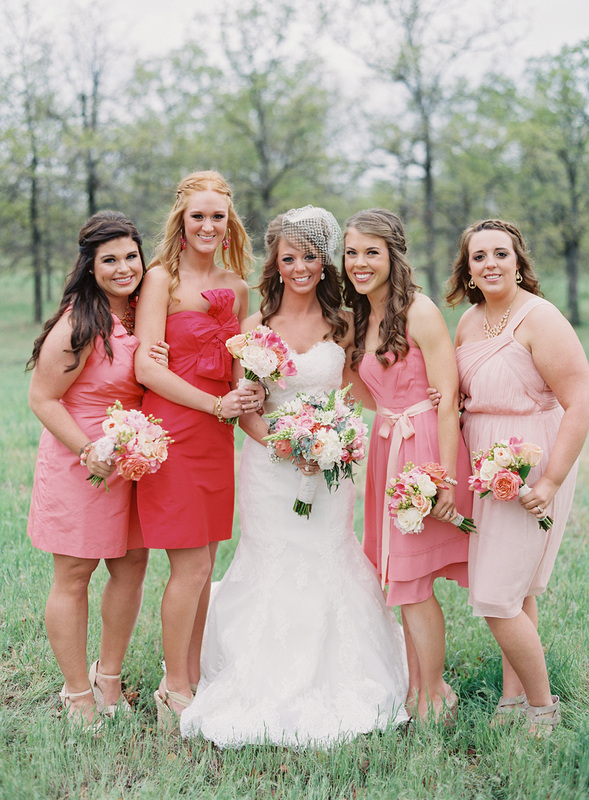 Any pointers…do’s or dont’s brides should consider when going this direction with their bridesmaid fashion? DON’T give them complete free rein. You want them to get a dress they love but setting them free to shop any store or online site in the world can give you some serious anxiety on what you might end up with on the big day. 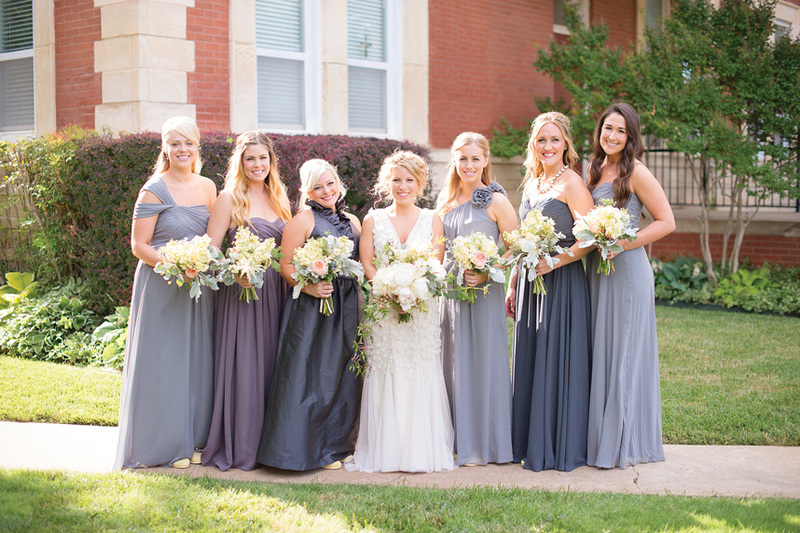 Booking an appointment in a bridesmaid store (for example ☺) gives them PLENTY of options with a little bit of control as to the style and shade you are envisioning for the whole party. DO be bold. 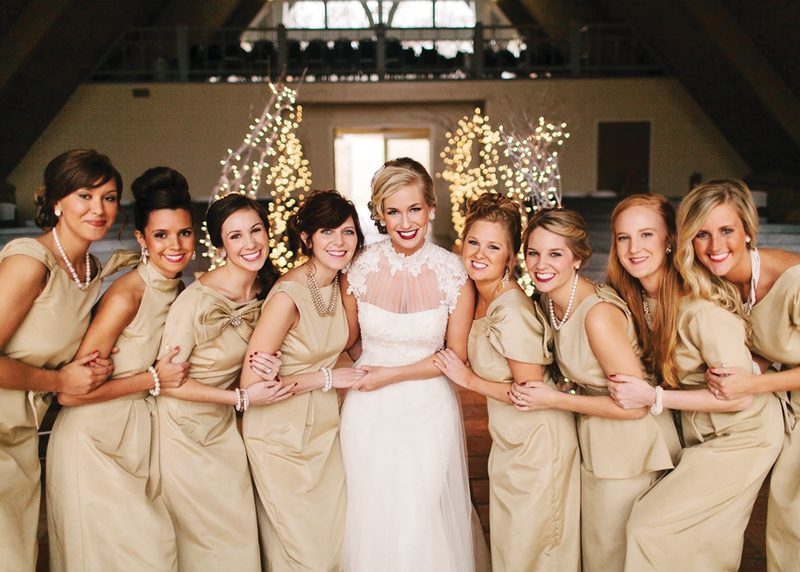 The best bridal party looks that I have seen are brides that aren’t afraid to do something different and out of the box. DON’T get discouraged. Mixing and matching does take a little bit more thought and visualization but it is worth it. DO know how your girls are going to be standing next to you. It is easier to already have this nailed down just in case two girls that are standing next to each other are looking at the same color/shade or fabric type. Thoughts on color schemes that work best for mix and match? I love selecting a color and then pulling shades of that core color. It really gives a nice variation. I am also a sucker for a good neutral palate, like nudes, champagnes, ivory or light brown.